More than 50 villages in Dera Ghazi Khan (DG Khan) were submerged with floodwater on Wednesday after the water-level rose in the Indus River. The flood damaged hundreds of acres of standing crops in the Malkani Qalandar area but the local administration remained absent from the areas. 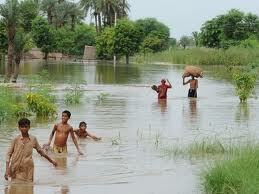 On the other hand, flood in the Seem Canal near Jaffarabad has inundated more than 300 villages. According to the Flood Forecasting Division, the Indus River has attained medium flood level at Chashma where the water inflow is 4,34,000 cusecs and the outflow is 4,15,000 cusecs. Water inflow at Head Taunsa was recorded at 3,97,000 cusecs whereas outflow remained 3,88,000 cusecs. There is a medium flood in the river at Kalabagh where inflow was 3,51,000 cusecs and the outflow 3,43,000 cusecs. At Tarbela, water inflow in the river was recorded at 2,80,000 cusecs and the outflow was 2,81000 cusecs. Meanwhile‚ the Flood Cell Peshawar said the Panjkora River had attained medium flood level at Dir. The Kabul River at Warsak and Nowshera, the Indus River at Khairabad and Khiali River at Charsadda Road are reported to be in low flood.